I had a cauliflower in the fridge that was taunting me... what to do? I wanted to try something new, and hopefully something Wyatt would like. So I dusted off my Pinterest account and got to browsing. 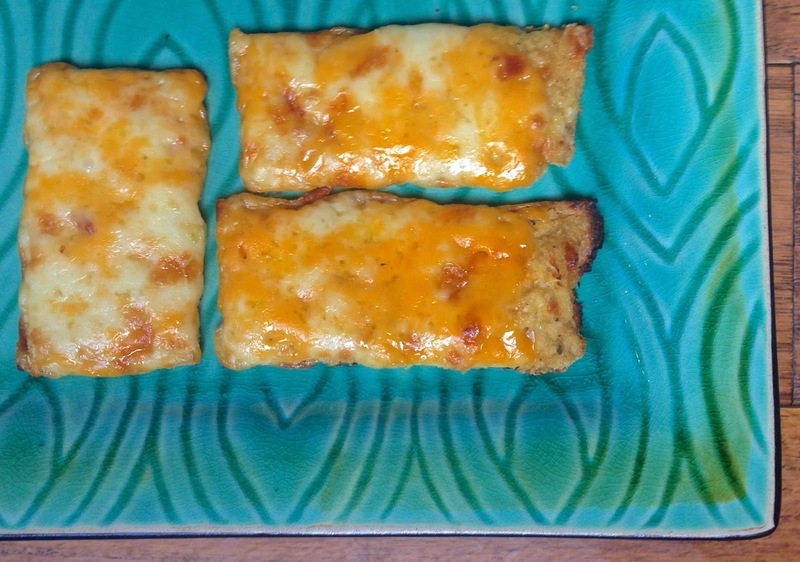 I saw some cheesy looking delights on and found a great recipe from Delicliously Yum. I altered it a little bit based on what ingredients I had, and it came out great! But alas, only the adults in the household ended up devouring this recipe. I couldn't stop myself from picking up piece by piece and shoving them into my mouth. But I did end up saving a couple of pieces to dunk in my yummy Lentil Soup, and boy was it worth it! These little gems make great dunkers. 2. Wash and clean cauliflower and cut into florets. With the help of a food processor, shred cauliflower until it forms a rice like texture. Be careful not to over process the cauliflower or it turns to mush. It's fine if a couple of bigger chunks remain. 3. Put cauliflower into a baking dish (like a casserole dish) and bake uncovered for 20 minutes. Remove from the oven and let stand for 10 minutes or until safe to handle. 4. Place roasted cauliflower in the middle of a tea towel, fold it by the ends and form a ball. Now squeeze out as much of the liquid as you can. Approximately 1-1 1/2 cups or until it becomes too hard to squeeze out more. 5. Increase oven temperature to 450 degrees F. Place cauliflower along with egg whites, 1/2 cup shredded cheese, and all seasonings in a medium bowl. Stir until well combined. 6. Transfer mixture to the prepared baking sheet and shape into a rectangle or circle, about 1/4-inch thick. Place in the oven and bake for 20 minutes. Remove from the oven, sprinkle with remaining cheese and bake an additional 5 minutes or until cheese is melted and sides start to turn golden and crispy. Cut into breadsticks and serve with marinara sauce, or even better yet, some Lentil Soup. I don't even eat cheese, but I want this all over my face.